Decades of government subsidy have cost taxpayers, wrecked the environment and could burn even more carbon than the Keystone pipeline project. It’s Friday night in the “energy capital of the nation,” a sprawled-out strip mall in Campbell County, Wyoming, called Gillette. In a bar on Highway 59, the liquor bottles are backlit in neon green, and a bartender covered in glitter slings Budweiser Selects to small groups of big men. Various iterations of dudes beating the daylights out of each other occupy the television screens. The man feeding the jukebox chooses rock, never country. In Gillette, coal is king, and the cattle boom is long over. If the war on coal exists, this should be its front. 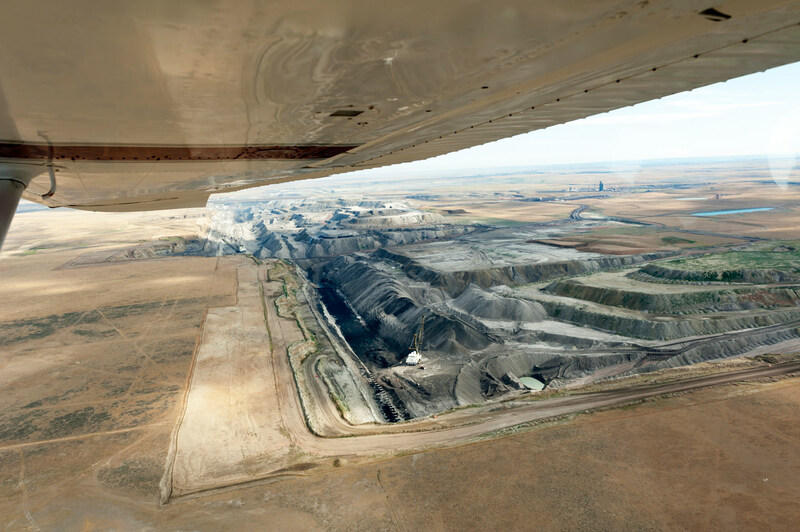 Running from the Big Horn Mountains east to the Black Hills and up into southeastern Montana, the Powder River Basin (PRB), as the region is known, produces nearly half the nation’s coal, some 400 million tons a year. Most of the mineral rights in the basin are federally owned, giving the government a near monopoly on Western coal stocks and significant influence in the market. Once burned, coal mined on federal land in the PRB accounts for 13 percent of America’s greenhouse gas emissions, making it the country’s largest single-source contributor to climate change. If anything, the government is on Mike’s side. Federal policy—specifically, the way the Department of the Interior leases land to coal companies in the Powder River Basin—has propped up the industry for more than four decades, at great cost to taxpayers and the climate. Little has changed during Obama’s tenure. Since 2011, as a result of the DoI’s leases, more than 2 billion tons of coal have been extracted from the basin. Eyeing coal markets in Asia, companies are lobbying for three export terminals in Oregon and Washington, with the capacity to more than double the tonnage of US coal sold overseas. The real war is being waged from the Powder River Basin to the Pacific Northwest. On one side are Big Coal, railroads and a handful of labor unions, tacitly supported by government policy. Ranged against them is a coalition of ranchers, Native American tribes and citizens concerned about the contamination of their land from mining as well as the effects of sending massive trainloads of fossilized carbon to new Asian markets through their backyards. The outcome of this battle, in terms of the amount of greenhouse-gas pollution at stake, is arguably more important than the Keystone XL pipeline, the Canadian tar sands project the climate movement has been fighting so vigorously. Mike was right to describe the struggle in existential terms: the one thing the two sides agree on is that the Powder River Basin defines their future. Russell Bell grew up on a ranch in Campbell County in the late 1950s and ’60s, when grass was the dominant currency. At midcentury, the basin was dying a slow death: gold, homesteading, cattle, oil and an early coal boom had all gone bust. Bell was an average student from a modest family. “There was no way, through agriculture, that I’d ever be able to go to college,” he told me. But about two weeks before graduation, he learned that a coal mine near Gillette was offering a full scholarship to a college in Casper. Bell applied, won, studied mechanics and at 19 started working in the Cordero Rojo mine, now owned by Cloud Peak Energy. Bell entered the coal industry just as it exploded in the basin. Beginning with the Clean Air Act of 1970, the Environmental Protection Agency gradually tightened the limits on sulfur dioxide emissions from power plants, making PRB coal, which is less energy dense (you have to burn more of it to get an equivalent energy output) but cleaner-burning than Appalachian coal, competitive with reserves in Kentucky and West Virginia. Demand for coal rose during the 1970s oil shortage, spurring further investment in the basin. Between 1970 and ‘80, the population of Campbell County doubled. By 1985, Wyoming was producing more coal than any other state. Today, two mines in the PRB—Peabody Energy’s North Antelope Rochelle and Arch Coal’s Black Thunder—produce a fifth of the nation’s coal. Cordero Rojo, where Bell spent a decade, is now the third-largest mine in the country. Another Campbell County rancher, L.J. Turner, told me that mineral royalties put his kids through college. But on balance, he said, coal has taken more than it’s given back. “The coal people and the mineral people make such a point of saying they pay so much in taxes… Well, they don’t pay very damn much,” he grumbled to me when I visited him in August. A generation older than Bell, Turner raises sheep and cattle on land that his family has ranched for more than a century. Turner has lost several thousand acres of grazing leases to mine expansions, but his main concern is water. A number of reliable wells on his property have dried up, along with the creek by his house. Magpies, barn swallows, sage chickens and bullfrogs have vanished. He isn’t paranoid: coal seams double as aquifers, and mining destroys the water. “Roughly 30 years of surface mining and the more recent CBNG [coal-bed natural gas, or methane] development have resulted in complete dewatering of the coal aquifer in localized areas,” the Bureau of Land Management (BLM) acknowledges. At most, 4 percent of the land ruined by mining in Wyoming has been reclaimed. To consider what coal has taken from the PRB is really to ask what the government has given away. Coal sales in the basin operate on a “lease by application” basis, which means producers nominate tracts of land they want to mine. The BLM auctions off the nominated parcel, but in most cases, only the company that applied for the lease shows up to bid. The BLM is charged with managing natural resources for the public good, but in effect coal companies set the land-use agenda. And although the BLM is legally obligated to reject bids lower than “fair market value,” recent investigations indicate that the agency has failed to calculate that value accurately for decades. In June 2012, the Institute for Energy Economics and Financial Analysis, an Ohio-based nonprofit, released a major report on the BLM’s appraisal process. Written by finance director Tom Sanzillo, the report concluded that its flaws had cost taxpayers nearly $30 billion since 1982, when a scandal over the sale of 1.6 billion tons of PRB coal at below-market rates forced the DoI to reform the leasing program. (That sale cost the government $100 million in lost revenue.) Until Sanzillo’s report, neither Congress nor any independent authority had bothered to check in to see if anything had changed since the ‘82 scandal. Instead, Salazar green-lighted major expansions of PRB coal production in 2011. “When you have a program that is controlling 40 percent of the nation’s electricity and nobody looks for thirty years, what do you think is happening?” Sanzillo told me. Environmental groups had been suing to stop new leases and, though they got little traction in court, a few people in Washington noticed. Senator Ed Markey, who requested the audit that uncovered the losses from the 1982 sale, asked the Government Accountability Office again in 2012 to probe the leasing program. The report is expected any day. The DoI’s inspector general did its own investigation, and in June reported that undervaluation and lack of oversight on lease expansions have cost taxpayers tens of millions. According to the investigation, an undervaluation of as little as a penny a ton amounts to $3 million in lost revenue per lease. Astoundingly, Beverly Gorny, a spokeswoman for the BLM in Wyoming, told me that the DoI has not told the bureau to reform the leasing process since the inspector general’s report, so the BLM is continuing with current policy. The DoI is also looking into another giveaway to PRB producers, who are selling more coal internationally as domestic demand drops. The government collects a 12.5 percent cut on the sale of federal coal; about half of that money makes its way back to Wyoming to fund schools and other services. Coal sold in the United States fetches far less than it does internationally, so the government should collect more on a ton of PRB coal sold in China than a ton sold to a power plant in Iowa. But a recent Reuters investigation found that the government lost $40 million in additional revenue in 2011 alone because coal sold overseas was valued at domestic rather than international prices. The article suggested that coal companies have avoided paying higher royalties on international sales by selling first to domestic subsidiaries. Authorities in Montana recently sued Cloud Peak Energy for $3.4 million in taxes they say the company evaded this way. It’s too simple to chalk up all this lost revenue to mismanagement at the BLM and DoI. During the 1960s and ’70s, a dominant concern of policy-makers was the creation of a cheap domestic power supply. To that end, the DoI launched the North Central Power Study in 1971, which recommended turning Montana and Wyoming into a vast industrialized range of interconnected strip mines, power plants and extra-high-voltage transmission lines—a sacrifice zone for the country’s energy needs. The study noted that “semiarid conditions throughout the coal regions make reclamation most difficult,” but concluded that “most of the region’s mining is remote to population centers where land values are quite low.” Seen through this historical lens, the leasing program looks less like a mistake than an intentional subsidy. Because the government controls most Western coal, leasing it cheaply would set a market standard that would result in low prices for the rest of us. Now, though, policy-makers have lost their enthusiasm for coal, thanks to climate change and the natural gas boom, and cheap coal is hardly a win for consumers. Below-market leases and the absence of a competitive bidding process make it more difficult for renewables to compete. Since the EPA’s carbon limits for power plants are expected to discourage domestic coal use still further, the point of the leasing program has become increasingly unclear. “The whole reason the coal is being offered for lease is that a company requested it,” explained Gorny. I told her that this sounded an awful lot like catering to the industry. “But that’s the whole purpose of the lease-by-application process!” she responded. What’s happening now between the government and Big Coal is less a war than the slow unraveling of a cozy business partnership. Before things fall apart completely, though, producers would like to put one final squeeze on the PRB. The Otter Creek Valley in Eastern Montana is a wide, grassy plain cut by red dirt roads and the “crick,” a slow-snaking stream that drains into the Tongue River. When I visited in mid-August, wheels of hay dotted the fields, and the bushes along the road were heavy with chokecherries. The quiet valley felt worlds away from the strip mines and strip malls of Campbell County. Arch Coal, however, has plans to turn Otter Creek into the largest new mine in the country, some 7,639 acres holding 1.3 billion tons of coal. Arch’s ability to sell Otter Creek reserves depends on construction of the Tongue River Railroad, a long-stalled forty-two-mile stretch that would cut through private ranches and an Amish community. One of the ranches the railroad would cross belongs to Wally McCrae and his son Clint, who breed cattle on land their family settled in 1882. The McCraes’ opposition to Otter Creek is based on property rights; they and dozens of other ranchers are alarmed by the railroad’s plans to condemn their land and the potential for pollution. The McCrae ranch sits just outside the town of Colstrip, home to Montana’s largest coal-fired power plant. Wally says that when he was a kid, his family was proud of the strip mine next door. “We would take our relatives from Minnesota over there and show them the ‘big shovel,’ the Bucyrus- Erie 1050, the largest scoop shovel in the world.” But coal, power and railroad companies have not been good neighbors, with one result being contaminated groundwater and poisoned cattle. 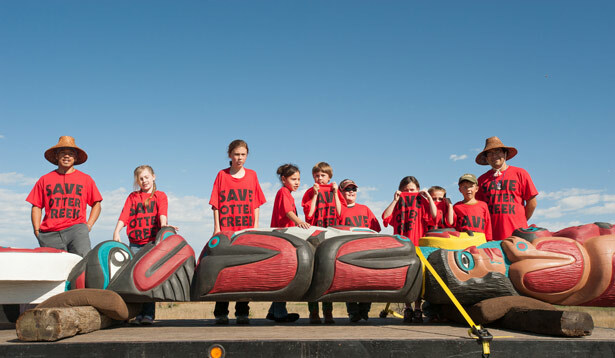 Opponents of Otter Creek also include residents of the Northern Cheyenne Reservation, which sits immediately west of Otter Creek and atop some of the largest coal reserves held by any tribe in the country. The Northern Cheyenne fought off coal development on their land in the 1970s, and although the economy on the reservation is in as dire a shape as it is for the neighboring Crow tribe, which inked a coal deal with Cloud Peak in January, many Northern Cheyennes have little faith in the promise of coal revenue. Vanessa Braided Hair is one of the most vocal opponents of the Otter Creek development. A descendant of Native homesteaders who were kicked off their land in Otter Creek, she has worked as a wild-lands firefighter for nearly a decade and has seen the intensity of the fires increase. Last year, the Ash Creek fire ripped through 250,000 acres and destroyed several houses. The fire was so hot along sections of the Tongue River that superheated sap blew the bark off the cottonwood trees, leaving bone-white snags. “It’s gotten worse and worse,” Braided Hair told me. “You know it’s due to climate change.” She organizes opposition to the mine on the reservation, and although she tries to make the connection between coal and the climate, she told me the most effective argument is about the danger to ancestral lands. The terrain is made up of rock bluffs and coulees, sagebrush, aspen groves and stands of ponderosa pine, wild raspberries and crab apples—far more difficult to reclaim than the flat grasslands of Campbell County, Wyoming. Otter Creek’s opponents worry that new infrastructure will open up the area to other mines. The Montana section of the PRB is largely untapped, and its reserves are greater than Wyoming’s, making the area attractive to investors. Otter Creek’s backers say the mine will be open within the decade, but in September the Tongue River Railroad Company ran out of money to conduct an environmental impact statement, delaying the permitting process by at least a year. Without the rail link, Otter Creek coal is stuck. Throughout the PRB, coal companies are scrambling to build routes to new markets. Historically, coal has left Wyoming via freight train for power plants in the Midwest and Southwest. But domestic demand has fallen steeply, as have appetites in Europe. Producers see Asia as the source of future profits, and shipping PRB coal there requires expanded rail capacity and new port facilities on the Pacific Coast. The three ports awaiting approval in Oregon and Washington would send upward of 100 million tons of coal each year to Asia, which amounts to roughly 200 million metric tons of carbon dioxide when the coal is burned. For comparison, the high estimate for the annual carbon pollution from the burning of oil transported via the Keystone XL pipeline is 181 million metric tons. In the Pacific Northwest, grassroots activism that began with local opposition to the prospect of uncovered coal trains rumbling along fragile waterways and through urban centers has expanded into a regional movement sounding the alarm about the many paradoxes and perils of expanding coal production in the PRB. This coalition—more than the government—presents a threat to Big Coal’s plans. Protesters have employed many of the lessons gleaned in the Keystone XL fight about creative direct action, and have raised the profile of the work that groups like the Powder River Basin Resources Council have been doing for years to challenge the leasing program. Vanessa Braided Hair and Clint McCrae both traveled west to testify at public hearings, which have drawn thousands. Critical to the opposition is the engagement of Native American nations, which have unique legal and cultural claims. The site proposed for the largest of the ports is on land in Cherry Point, Washington, an area sacred to the Lummi Nation. The tribe depends on fishing in the coastal waters that will be vulnerable to coal dust pollution. The Lummi Nation has protested the Cherry Point facility for months, and the fifty-seven-member Affiliated Tribes of Northwest Indians has asked for an environmental assessment that considers the regional and climate impacts of the terminals, as have the governors of Oregon and Washington. Federal agencies have so far declined to conduct a comprehensive study, so state officials are left to consider the projects individually. Regardless of market conditions, the United States Geological Survey predicts that the PRB has only twenty-five years of recoverable coal left. That’s plenty of coal to wreck the climate, but it’s a salient point in response to the claim that cutting back production in the PRB would devastate the local economy. Coal stocks have dropped by 30 percent in the past five years; production is on track to fall to a twenty-year low; and coal prices around the Pacific Rim have collapsed. “The coal industry is in free fall, and they don’t have a plan,” says Sanzillo. A managed drawdown could keep the PRB from mirroring Appalachia, where coal reserves are all but exhausted and companies are leaving a string of bankruptcies and shattered communities behind. Since federal policy crowned PRB coal king in the first place, it’s worth asking what kind of responsibility the government bears for managing regime change. Something extraordinary happened in August: for the first time, no one bid on a PRB tract the DoI offered for sale—not even Cloud Peak, the company that had applied for the lease. A month later, the agency rejected the lone bid for another tract because the 21-cent-per-ton offer was too low. Analysts viewed these failed auctions as another sign that regardless of federal policy, the markets are imposing their own moratorium. In the May 20 issue, Naomi Klein reported that some mainstream environmental organizations are trying to wean themselves from fossil fuel investments—but some aren’t.